You might not be able to see them, but nitrates are hiding in every aquarium. Understanding this invisible compound is an important part of maintaining happy and healthy fish. This cycle forms the foundations of what I am about to tell you. What happens if your nitrate levels are too high? What are the right nitrate levels for your aquarium? How do you remove nitrates from your aquarium? How do you prevent nitrates from building up? 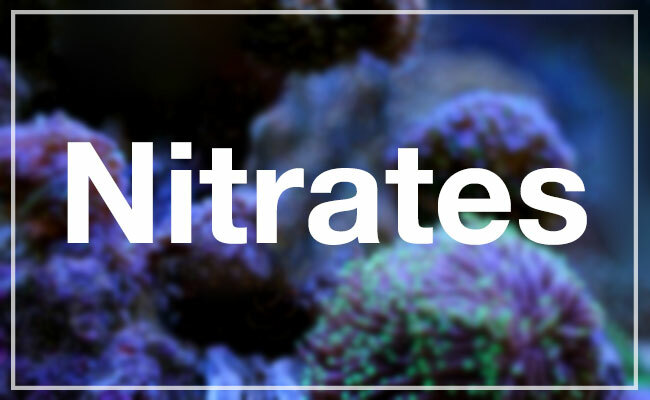 Nitrates (NO3) are a form of dissolved nitrogen that occur naturally in the water column, which is the water inside your aquarium. Nitrates are actually a by-product of waste. FishLab Fact: Overfeeding is the number one cause of high nitrate levels in aquariums. Not only do overfed fish poop more, but any uneaten food rots, leading to even more nitrates. Overstocking your aquarium comes in as a close second – watch that bioload! But while waste results in nitrates, it is not the cause of nitrates. To explain, I am going to do a very brief recap of the nitrogen cycle. Before waste becomes nitrates, there are a couple of steps that happen first. 3. 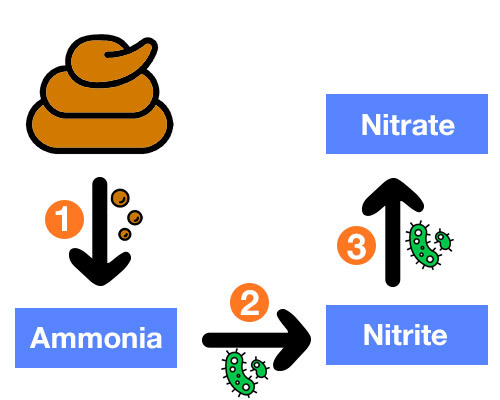 A second bacteria, called nitrobacter then feeds on the nitrites and produces nitrates. So without nitrites, nitrates in your aquarium wouldn’t exist. But don’t get confused. The two are very different. Nitrites are highly toxic to your fish, while nitrates are considered harmless, at least in small amounts. Now, I must stress this… harmless in small amounts. Over time, nitrates will build up in your aquarium. This process is continuous and unavoidable. When this happens, you need to reduce the nitrate levels in your tank, which I tell you how to do later in this guide. FishLab Fact: A sudden jump in nitrate levels is called a nitrate spike. I’ll be frank with you, unless you stock sensitive fish or corals, it’s unlikely that an increase in nitrate levels is going to outright kill your fish. But that doesn’t mean that high nitrate levels are not dangerous in their own way. You see, high levels of nitrates place your fish under incredible stress. Have you ever gotten so stressed that you became sick? Well, that’s similar to what happens to your fish. The stress caused from increased nitrate levels make your fish more susceptible to diseases. Fish that are exposed to high levels of nitrates may have stunted growth, meaning they may never reach their full size. Fish that are stressed by high levels of nitrates won’t display their natural coloring the way they would under normal, healthy conditions. You may even find that your fish’s color will fade. If you are trying to breed fish, then you definitely want to keep nitrate levels low! High levels can damage reproductive organs, meaning your fish will be unable to make babies! Fish that constantly live in water with high levels of nitrates do not live as long. While some of these problems are reversible, others cause permanent damage to your fish or even shorten their lifespan. To put it simply, if you want to raise happy and healthy fish, you need to get your tank’s nitrate levels under control. The type of fish, plants or invertebrates you stock. FishLab Fact: The measure for nitrates is ppm (parts per million). For you metric folk, this is the same as mg/L (milligrams per liter). In a perfect world, nitrates should be kept between 5-10 ppm or lower. Whether it’s due to a lack of time to perform proper maintenance, laziness or just a lack of understanding, fish often live in extreme nitrate levels. But just because your fish are surviving, that doesn’t mean they are happy or healthy. Below are suggested upper limits for nitrate levels that should not be exceed for freshwater and saltwater tanks. Note: The nitrate levels above are general guidelines. Individual species of fish, plants or invertebrates may have more specific requirements. And remember: Just because your tank is within those limits doesn’t mean that your fish are happy. As you can see from the charts, marine fish are much less tolerant of high nitrate levels than freshwater fish. FishLab Fact: High nitrate levels can lead to disease, cause reproductive failure and may even stunt growth in fish. If you keep a hospital tank for any sick or injured fish, keep the nitrate levels in this tank below 10 ppm. It is also worth mentioning that many varieties of algae feed off nitrates in the water. Many algaes use nitrates as a food source. In this case, I recommend keeping the nitrate levels below 10 ppm. 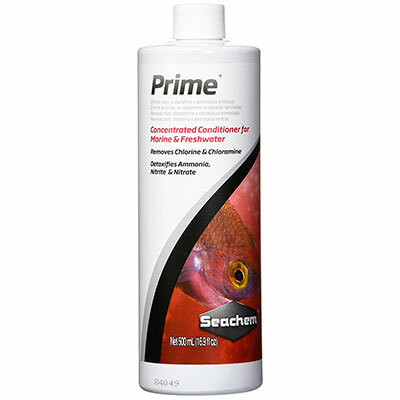 This helps deprive the algae of its food source, making it easier to eradicate. FishLab Fact: The “lower nitrates are better” rule is thrown out the window if you have a planted aquarium. Many plants use nitrates for food, and in this case, low nitrate levels can actually cause problems and can even lead to a blue-green algae (cyanobacteria) outbreak. To identify the nitrate levels in your aquarium, all you need to do is go out and buy a colorimetric test kit that is specifically for nitrates. 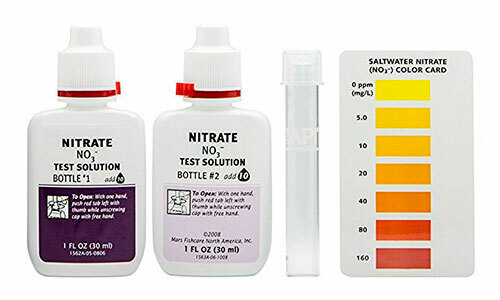 Nitrate test kits are typically designed to work for both saltwater and freshwater aquariums. If you have ever tested pH, then you will know how these test kits work. Take a sample of water from your aquarium, add a couple of drops of the solution included in the test kit and watch the water change color. If you walk into your local fish store, this will likely be the test kit they keep on the shelf. What can I say? It’s cheap, and it works. For the everyday fish keeper, the API test kit will be more than appropriate. However, since nitrate test kits are technically measuring nitrites, they have the same shortcomings that the nitrite test kits have – amine interference. In certain cases, such as in reef tanks, essential amino acids – amines – can cause the tests to show a lower nitrate level than what is actually occurring in your tank. Fortunately, there are test kits that get around this issue. Unfortunately, many of these kits are expensive. This nitrate test kit hits the sweet spot for both price and performance. It may not last as long as the API test kit, but it makes up for this by being easy to use with accurate results. 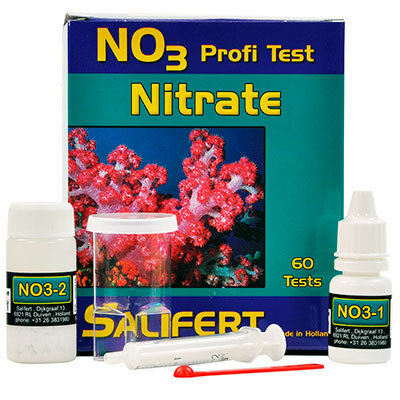 The Salifert nitrate test kit is popular with many saltwater tank owners. Since it can be picked up for just a few more dollars than the API kit, I recommend making this your go-to nitrate test kit. While nitrate test kits are easy to use, their accuracy depends on your ability to follow the instructions. Just tested your nitrate levels and discovered it’s through the roof? I am now going to cover all the ways you can lower the nitrate levels in your aquarium. The battle against nitrates is never over! As long as your fish are eating and pooping, there is going to be waste in your aquarium, which means that unless you act, your nitrate levels are going to continually rise. The only way to win this battle is to remove every fish, plant and natural organism from your tank – at which point, I would hardly call it an aquarium. If that isn’t an option for you, and it shouldn’t be, then you need to monitor and reduce the nitrate levels on a regular basis. You cannot eliminate nitrates – you can only control them. Now that we have that out of the way, let’s take a closer look at the different ways you can remove nitrates from your aquarium. A partial water change should already be a part your maintenance routine. And if it isn’t? Well, it’s no wonder your nitrate levels are so high. A water change is a great way to instantly lower the nitrate levels in your aquarium. You should also be mindful that nitrates can be present in tap water. This is a particular problem for those who draw water from wells. If you use tap water for your water change, test for nitrates before putting it in your tank. If high levels of nitrates are found, consider using a different water source, like reverse osmosis (RO) water. If your aquarium is under control, a water change should be all that is needed to adequately reduce nitrates to safe levels. However, for those who need a bit more help in the fight against nitrates, there are three more solutions to lower the nitrate levels in your aquarium. Be mindful that these extra tips for removing nitrates won’t replace a water change – they should be used in addition to it. This is essentially a nitrate remover in a bottle. Simply add the recommended amount and watch your nitrate levels drop as if by magic. Exactly how the water conditioner reduces nitrates varies from brand to brand. Some convert the nitrates to nitrogen gas, allowing it to exit through the surface. Other water conditioners bind the nitrates, rendering them harmless to fish and making it possible for the bacteria in your biological filter to destroy them. Whatever the method, the end result is the same – lower nitrates. Not only can it detoxify nitrates, but it can also deal with nearly any other water quality issue that may arise! I highly recommend keeping a bottle on hand just in case of an emergency. While the bacteria in your filter might do a great job of getting rid of nitrites, nitrates are another story. You can give your filter a turbo charge by using a media that traps nitrates, removing them from the water. If you have been in the fish-keeping game for a long time, you might remember the name Siporax. If you are like me, you probably thought that it had vanished forever. But it turns out that Siporax is fantastic at encouraging the growth of denitrifying bacteria that breaks down nitrates! 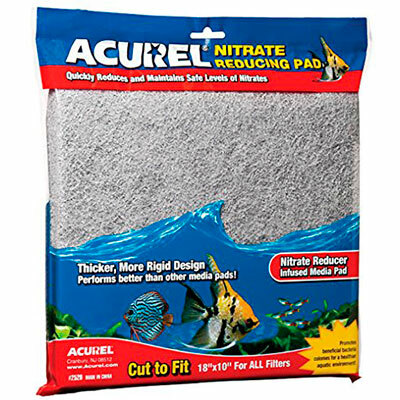 These pads are infused with nitrate-reducing agents to trap and remove nitrates from your water. The best part about these nitrate pads is that they can be cut to size. It doesn’t matter whether you have a small HOB filter or large pond filter, you are guaranteed that the pad will fit. However, nitrate pads do have an obvious drawback – they need to be replaced constantly. The typical lifespan for a nitrate pad is 2-3 months, after which it needs to be tossed in the trash. This is why high nitrate levels often result in an algae outbreak. However, it is important to note that plants draw nitrates out of the water at different rates. In fact, most plants are rather ineffective at lowering nitrate levels. Rather than planting inside your aquarium, consider planting inside your filter. Plants such as lucky bamboo and pathos not only look great when growing out the top of your aquarium, but their roots draw up nitrates as they pass through your filter, removing them from the system. These methods only remove nitrates – they don’t fix the cause of them. If your nitrate levels are constantly spiking, then it won’t matter how often you reduce the nitrate levels in your aquarium. The cause is still there. If you read my guides on ammonia and Nitrites, then you will already be fully aware of the advice I am going to give you. Waste -> Ammonia -> Nitrite -> Nitrate. While these tips won’t remove or reduce existing nitrates in your aquarium, they will stop new nitrates from building up as quickly – which is a good thing! The more your fish eat, the more they are going to poop. And the more they poop, the faster nitrates will build up inside your aquarium. I would also add that any food that remains uneaten sinks to the bottom of your aquarium and rots. And, you know what that means? More nitrates! If you have live plants in your tank, then you want to incorporate a bit of underwater gardening. Over time, old leaves on your plant will die. When this happens, the leaves fall off and decay, which leads to an increase in nitrate levels. Get ahead of this by doing a bit of light pruning. You know all those loose bits of food, plant matter and poop? Well, they are sucked up and trapped by your filter. With time, this waste accumulates. When this happens, your filter turns into a nitrate factory. All of these contribute to nitrates forming in the water. Ideally, you should be performing a gravel vac during most, if not all, water changes. An overstocked aquarium is going to have more nitrate problems than an understocked one. It’s unavoidable. Too many fish in a small aquarium will create more waste than the tank can handle, which is a surefire recipe for a spike in nitrate levels. I know it can be difficult to say goodbye to fish, but it’s for their own good. They are just going to suffer in an overstocked tank. You have been looking for a good excuse to buy a larger aquarium, and nitrate problems are as good a reason as any to make the upgrade! Phew! If you are still with me, then you made it to the end of this guide! I know it’s a lot to take in, but nitrates are an important part of every aquarium, and understanding their role and how to control them is essential to raising happy and healthy fish. Do you have any nitrate tips? Let me know in the comments below! I Google searched “normal nitrate level in freshwater planted tank” and randomly picked your article. I was curious about a few things pertaining to nitrates and your article not only satisfied my curiosity but also taught me more about nitrates that I didn’t know. Thank you for a well written article that was easy to understand and really informative. My husband and I have multiple freshwater planted tanks (and an empty 40 breeder and 20 high still to setup), 3 betta tanks and love our fish. As knowledgable as a fish keeper may or may not be, you always have forgotten something, need refreshing or need to learn something new. I find so many times articles are either lacking or written for PhD level readers. That’s why I took time to praise your article because it was written perfectly (I also learned my nitrates are right on par for the one planted tank that was at 30 but can’t understand why all the others are lower, but since it’s normal level and my tank is fine no biggie I guess) and I enjoyed it. Yes I do love learning new fish related things… It’s how I keep my fish kids at their optimal selves lol! Take care! It sounds like you have been bitten by the fishkeeping bug, the two empty tanks still to be set up is an obvious clue. It’s an addiction! Thank you so much for your kind words. It means so much to me that I could help! great info ! been into fish 4 30 plus years , i have a 180 gallon african tank with a fx6 , checked into the siporax u recomend witch one is the best for me they have many different ones !! A 180 gallon African tank sounds darn impressive. Do they have more than two types of Siporax now? Last I checked, there was only the “ceramic ring” style and small circular pellets for tiny filters. The ceramic ring style is what I use in my canister filter. Being an acid (nitric acid) isn’t it possible for high nitrates to kill beneficial bacteria and bring about a total tank crash (i.e. the conditions of an uncycled tank – a deadly ammonia spike)? Absolutely, but this would be an extreme scenario. In all my years, I have never heard of this occurring since water changes are used to maintain the nitrate levels. If your nitrates get so high that they are rapidly dropping your pH then it would be due to poor practices such as not maintaining your aquarium or overstocking your tank to ridiculous amounts. At this stage, your dead fish would likely be the clue that something is wrong. Are there any types of Nitrate reducers that can give a false positive? I have a 120 gal and a 75 gal salt water tank. I perform water changes bi-weekly and have in my large tank, in my sump, a good protein skimmer, a nitrate pad, and I use a natural Nitrate Reducer (Instant Ocean brand). My levels are between 120-140 ppm. My 75 gal, I have a good HOB protein skimmer and a reactor with NP active Pearls. My 75 gal levels are lower, but it is still about 60 -80 ppm. I do not over feed and my bio-load is 8 fish, about 15 hermits and 1 emerald crab in the 120 and 6 fish and about 20 Astraea Turbo’s in the 75. I was told that the nitrate reducer can give you a false reading. I want to put a bubble tip anemone in each tank but I know they are susceptible to nitrates. Any help would be greatly appreciated. Unfortunately, I have don’t have a whole lot of experience pertaining to use of nitrate removers in saltwater tanks. This is a question you should ask over at reef2reef or reefcentral, these are great forums and I am confident someone over there will be familiar with your problem. I wish I could help you further. I have a 55 US gal tank and my filter is a “gravel filter” with two PH-16 Aquatop pumps in each back corner of the tank, circulating the water through the gravel. I know most Pros think “gravel filters” are “old school”, but works for me. 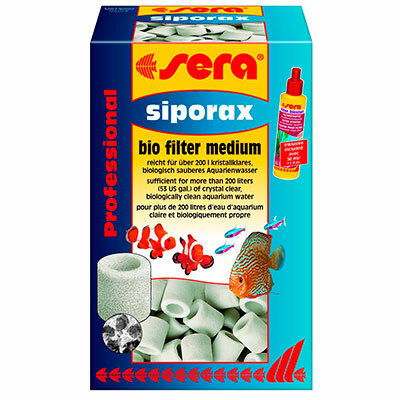 My question is: Could I use the Sera Siporax product and sprinkle on top of the substrate (gravel)? Yes you could. Just be mindful that over time your under-gravel filter will clog and the water flow will reduce. This will reduce the efficiency of it to filter your tank. When this happens, you’ll have to do a deep clean which will involve removing your substrate. It’s for this reason I recommend other types of filter that sit inside or outside your tank instead. I’ve just read your articles on Nitrates. I have a freshwater aquarium with fancy goldfish and have been using the JBL Pro Scan strip tests which I use at least weekly. I need advice as the NO3 has been stuck on 50 for 4 weeks, despite changing 60% of the water each week. The strips are in date, and I also test at the same time per day with the test card in the same position, under natural light. I performed the test immediately before the last water change (c.60%) and immediately after it (45 mins later) and the reading was the same !…… My fish seem happy enough but I’m guessing I need to switch to a liquid reagent test kit !……. Would this be your advice ? I personally don’t recommend test strips because they often return an incorrect reading, even when it looks like everything in order. Test kits are more affordable (the API master test kit has everything you need for hundreds of tests) and much more accurate. Once you have double checked your results, then you’ll be able to take appropriate action. Have been in the water keeping hobby for a number of years and everything I’ve read to date has said there isn’t a bacteria that will use nitrate. This fact requires that we perform large, frequent water changes to remove this form of nitrogen from the fish tank. Lately, I’ve heard that such a bacteria does exists. Is this true? Yes, this is true. It’s an anaerobic bacteria that lives deep in media without air. In a freshwater tank, it’s not going to remove enough to offset water changes due to the amount of media that would be required. Besides, a water change has other benefits such as restoring essential nutrients. However, their are certain medias that encourage this bacteria to grow. In a saltwater tank, live rock carries these bacteria. 80ppm of nitrate is quite high for a saltwater tank, especially if you have corals. It’s possible these high levels of nitrate are responsible for your algae outbreak. You’ll either need to make a change to your tank or routine to lower these levels. Once you have the nitrates in check, manual removal of the algae should be enough to prevent if from coming back. Hello my problem is that my nitrates are at 150 I clean the tank every week and I had my fish for 3 years I have a Oscar my ph is 72 I clean the tank today and still at 150 what’s up with that I need some help. Oscars are messy, it’s possible you are not performing water changes frequently enough to keep up with the waste produced. This is a common problem when a tank is too small for a particular type of fish. You are spot on, in an aquarium setting, algae often appears as a result of a nutrient imbalance, often an excess of something, such as nitrates. Because the goal of aquariums is often to keep the water as clear as possible (it makes it easier to view fish) algae is unwanted, no matter how natural it may be. It’s interesting isn’t it, how often do you see perfectly clear water in nature? Outside, such as your pond, there are plants, algae and even bacteria that eat nitrates. The ecosystem works as a whole to balance out (things wash into the pond, etc.) because the aquarium is a closed system, we have to create this balance ourselves. Aloha. I have a 5 gal freshwater tank with a single betta in it and about 6 live plants. I tried to look for info about where I might be in the nitrogen cycle– I tested my water this morning and have no nitrates, but a small amount of nitrites. Could you perhaps provide some insight as to where you think I might be? I think I had a small algae bloom last week, but now the tank is super clear (well, as clear as a blackwater tank can be, lol…) Mahalo. Nitrites are the second stage of the nitrogen cycle. These will continue to build up until bacteria establishes itself that converts the nitrites into nitrates. As for how long this takes? It depends. For some it’s a few days, others it’s a couple of weeks. If the algae bloom turned your tank foggy then it was likely a bacterial bloom, as discussed in our cloudy aquarium water guide. This harmless cloud commonly appears as your tank cycles and quickly disappears. Here is a chart I created the last time I cycled my tank, to keep track of it. You can see that as ammonia levels drop to zero, nitrites appear – this is the second stage. I have big nitrate problem I’ve did many water change and still have the problem you have any other suggestions I’ve vacuum the bottom 2 or times changed all filters ? That’s no good. If nitrates are accumulating to dangerous levels before it comes time to your weekly water change then it’s possible that your tank is either overstocked or you are overfeeding your fish. I have the same issue did everything possible and nothing worked. I then decided to buy an undergravel filter and 2 power heads and with in 3 day my nitrates are at zero. While I thank you for weighing in, nothing that you have listed here will reduce nitrates to zero. I have 40 koi. In 18,000 pond.the filtration up the yingyang the turnover rate is 1-1/2 times per hr. I clean the filters weekly. But only about 1 thousand gallons. Water temp was 88 degrees Fahrenheit. For 2 weeks I try and keep it shaded all day. But it wasn’t working so I did a major water change 18 hrs.the nitrates went from 20-ppm to 0-ppm. And I have salt level @ 3%. Some fish were showing signs of stress so that’s why there’s 3% salt. Also had a huge algae bloom. How long should I leave the salt level there. Ten years and never had a problem. I live in Chicago and I heat the pond all winter at 72 degrees until spring time. And never ever tested the water… so ok the fish are growing more I’m on top of the filters but not enough water changes. ???? Thanks Arthur. Unfortunately, I do not have any experience with ponds – our main focus at the moment is building the best online aquarium resource that we can. While we may expand to ponds in the future, we currently do not have any staff experienced in owning and maintaining ponds. Sounds like a custom filter designed to help denitryifying bacteria to to grow, these bacteria feed on nitrogen. These are the same anaerobic bacteria that I mentioned earlier in this guide, although this filter takes that concept and significantly ramps it up. Denitrifying bacteria converts NO3 to N2 in anoxic conditions which is slightly different than anaerobic conditions. Dissolved oxygen levels in anaerobic conditions is absolute 0 mg/l, in anoxic conditions it is between 0 and 1 mg/l but not 0. Thorough and great info. Thanks!